A Natural and Healthy Way to Relieve Arthritis Pain. 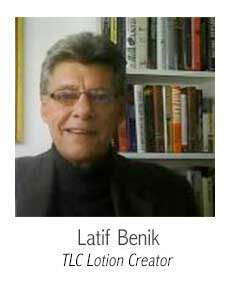 My name is Latif Benik. A few years back, I was diagnosed with arthritis in my neck, shoulders and hands. I tried everything to get relief, but the best result I could achieve was a combination of physical therapy and pain pills. But I wanted a solution that would not cause me to become dependent on pain pills. Pain Relief Was My Goal. After experimenting with different solutions, I came up with a natural lotion infused with plant extracts that dramatically reduced my arthritis pain. I call this amazing pain relief discovery TLC Lotion, and it has helped me so much, I feel I must share it with others who are suffering from the pain and debilitation of arthritis. For information about our Distributorship Programs, please contact us. The Lotion Company LLC | A Natural and Healthy Way to Relieve Pain.